Bainbridge and Ally (2015) then list a number of distance, e-learning and virtual university. Interestingly, the authors do not list the Open University UK (founded 1969, 168,000 students) as an open university, although it is one of the oldest and best know of the institutions with "open" in its name. Australia has no open universities, that is institutions which have no entry requirements. There is Open Universities Australia (established 1993, 60,000 students), but this is a consortium of conventional universities, offering distance education. Bainbridge, S., & Ally, M. (2015). 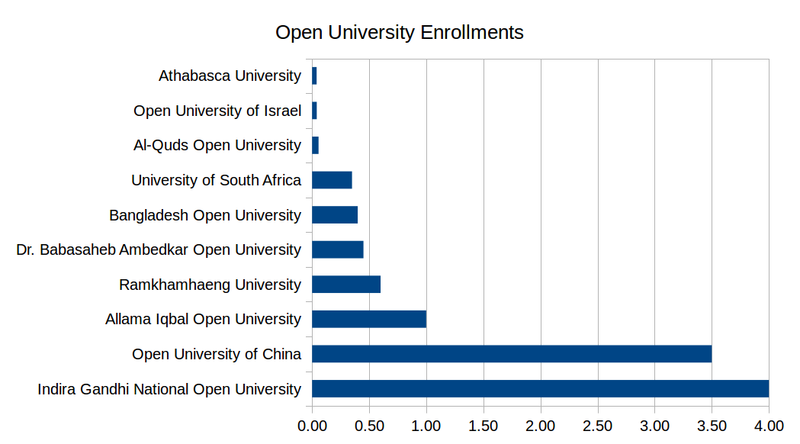 Open and Virtual Universities Worldwide. International Handbook of E-Learning Volume 2: Implementation and Case Studies, 167.